Measurements:	11.07 x 7.62 x 7.13 mm. 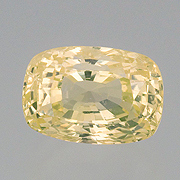 Light colour yellow sapphire from Sri Lanka. Good brilliancy and slightly included.